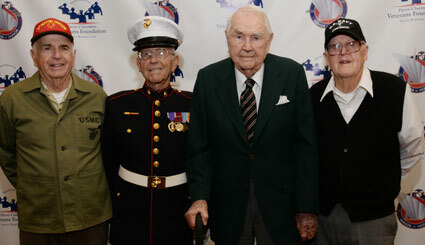 History recently came alive at the 4th annual Pierre Claeyssens Veterans Foundation luncheon and symposium in Santa Barbara, featuring four veterans who survived one of the most significant battles of the Pacific during World War II: Iwo Jima. The luncheon honored Cpl. Benedict E. Bellefeuille, Cpl. Joseph Hale and Lt. Col. Bob Beckham, all Marines, and Pharmacist’s Mate Kenneth E. Morehouse of the Navy—all of whom reside on the Central Coast. The program included presentations about these four veterans by other veterans, along with historical information about the battles as well as film clips and music. Following a short version of the “Sands of Iwo Jima” film, individual awards were presented. Each of the honorees was presented with a commemorative plaque and a bottle of special label Jarhead Red wine. Pictured below is Mr. Morehouse signing bottles of Jarhead Red prior to the event. We salute the honorees and all of the veterans who made this event happen, and we were honored to have Jarhead Red play a small role along the way. Click here to read a full recap of the event. And thanks to Maureen “Mo” McFadden, legendary Santa Barbara P.R. practitioner, for sending information and photos.